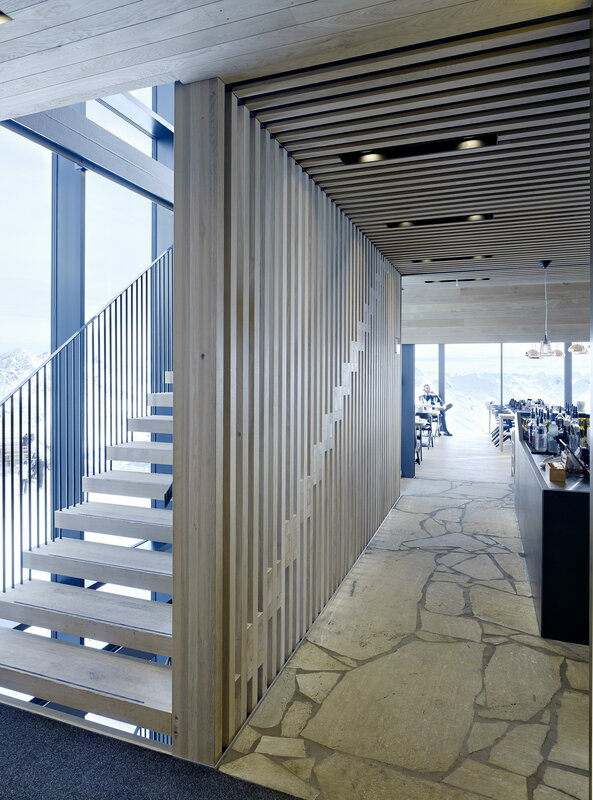 There have been many challenges while designing an alpine restaurant above 3.000 meters. 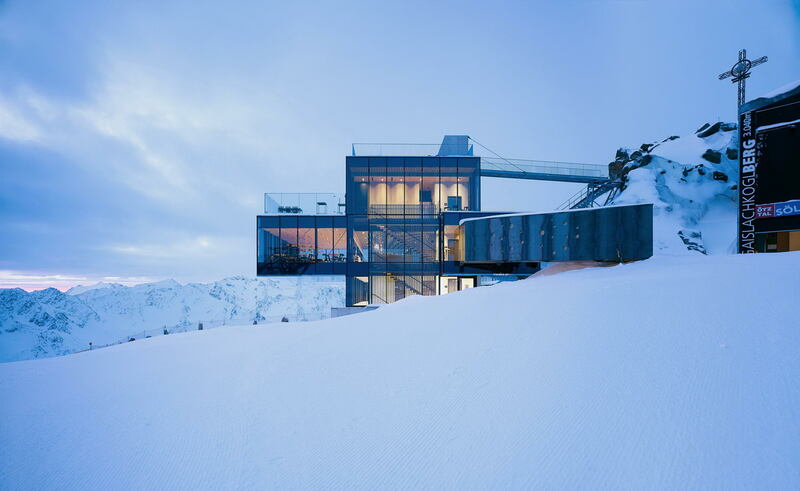 The context, the Gaislachkogl mountain peak, at 3.048 meters above sea level, with endless, spectacular views above three countries – the Italian Dolomite, the German Zugspitze and diverse Austrian glacier (Pitztal, Ötztal, Stubaital and Zillertal) obviously played a huge role in the design concept. 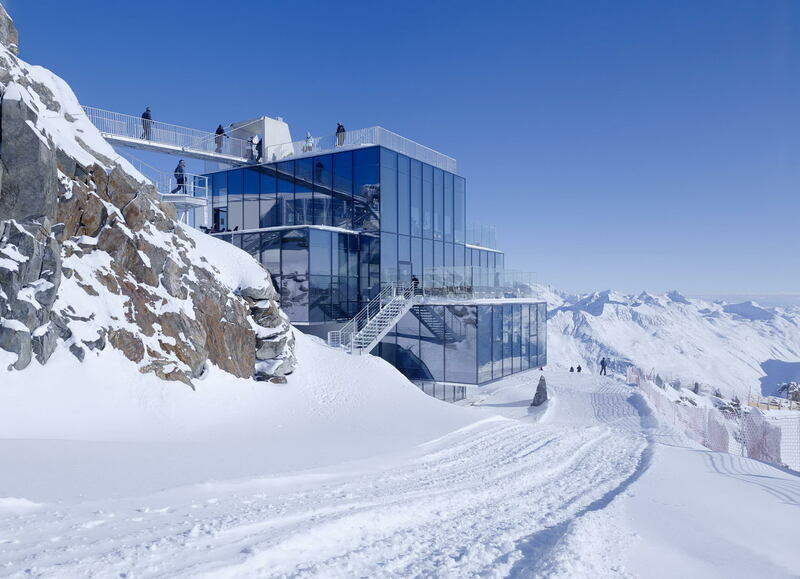 The name ‚ice Q‘ came from the design concept: a crystal sculpture, recalling the image of stacked ice blocks, throwing breath-taking views over the alpine scenario and framing the glaciers from the inside. Cantilevered volumes and wide sun terraces invite to linger and witness the inviolate stillness of the landscape. 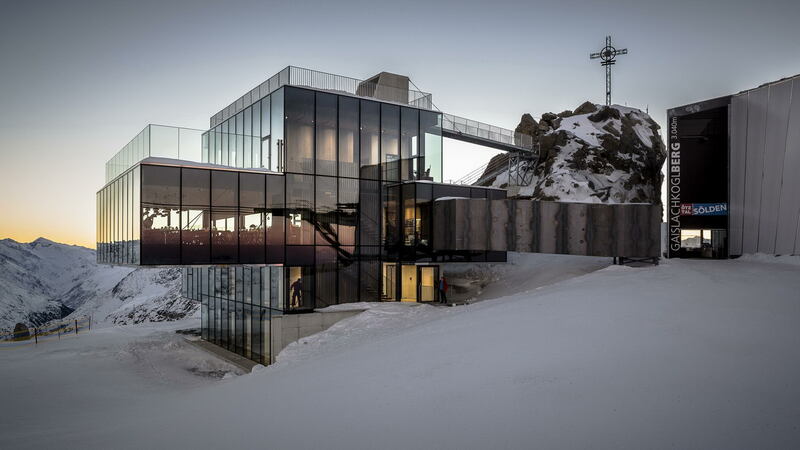 At ground floor level, easily reachable for visitors reaching the Gaislachkogl through cable car, a transparent extruded volume gives access to the restaurant, serving as a weather-shelter and as transition-space. Diffuse and colorful LED lamps underline the prestigious wine depots of ‘Pinot 3000’, introducing to the bar and further to the restaurant, with a wide terrace facing south. On the first floor are located a lounge area, suitable as well as conference room, and a spacious west-terrace catching the sunset light. 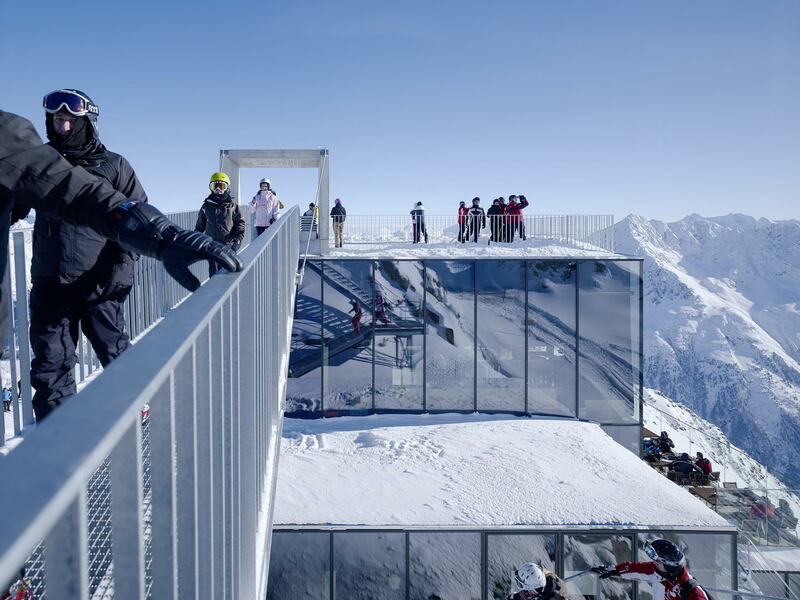 The roof of the Ice Q, conceived as a free-access panoramic platform, connects to the Gaislachkogl peak through a suspended bridge. The interiors display environmental-friendly materials, profiting from the regional context: the virgin stone paving the entrance has been extracted from the local glacier, untreated massive wood from the region have been chosen for walls, floor and ceiling cladding comes from the region. Aiming to a discrete and distinctive ambiance, for draperies and seat coatings have been chosen loden fabrics, for carpets pure lamb’s wool. In the bar area has been employed black stainless steel, as symbolical reminiscence of open fireplaces in traditional chalets, where smoke used to darken walls and ceilings. 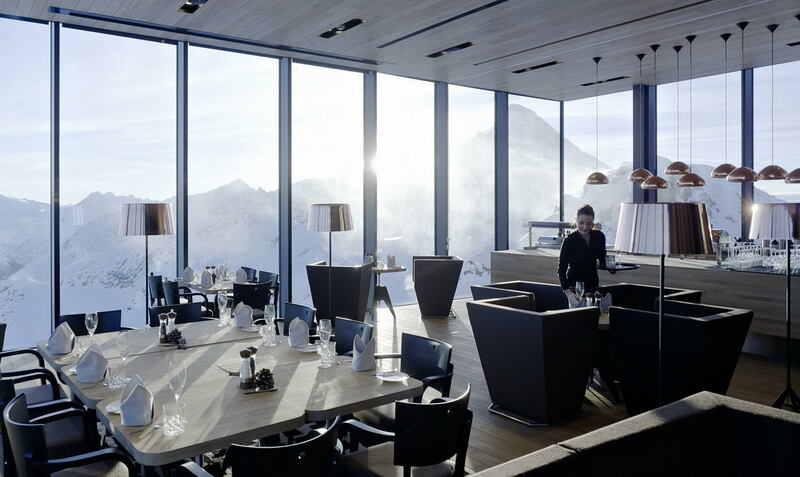 The ice Q, with a restaurant counting 100 seats and a lounge bar with 40, offers to its guests a high-end recreational oasis. The carrying foundations have been reduced to an essential minimum of three punctual, naturally ventilated supports. Hydraulic re-adjustments in height are controlled by a digital remote-control system, enabling the building to adapt to the imperceptible movements of the soil, furthermore preventing any heat transmission from the structure to the underground, a permanently frozen rock-conglomerate called Permafrost. 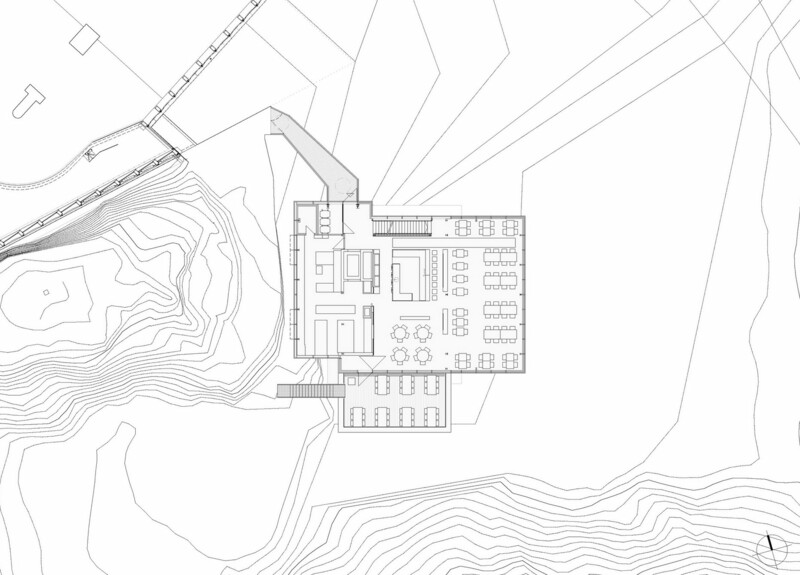 The basement-floor, operating as a technology-control center, has been conceived as a stiff reinforced concrete cube. 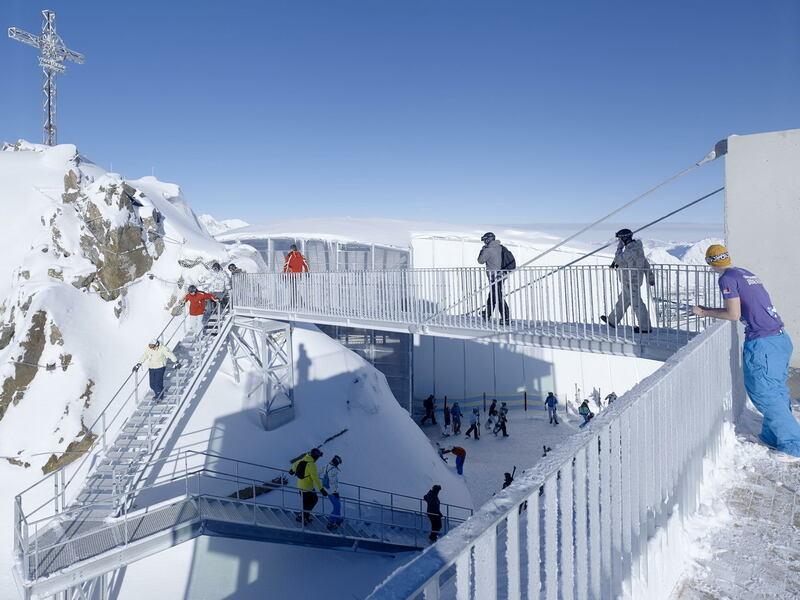 Above it a steel structure, with ceilings made of massive crossed-glue wooden beams. The façade consists of a mullion-transom construction wrapped by triple glazing elements. Partly enameled glazing vertically frame the floor areas. The corners have been realized as full glass constructions. The flooring consists of hollow constructions, to guarantee maximum flexibility for installation requirements. 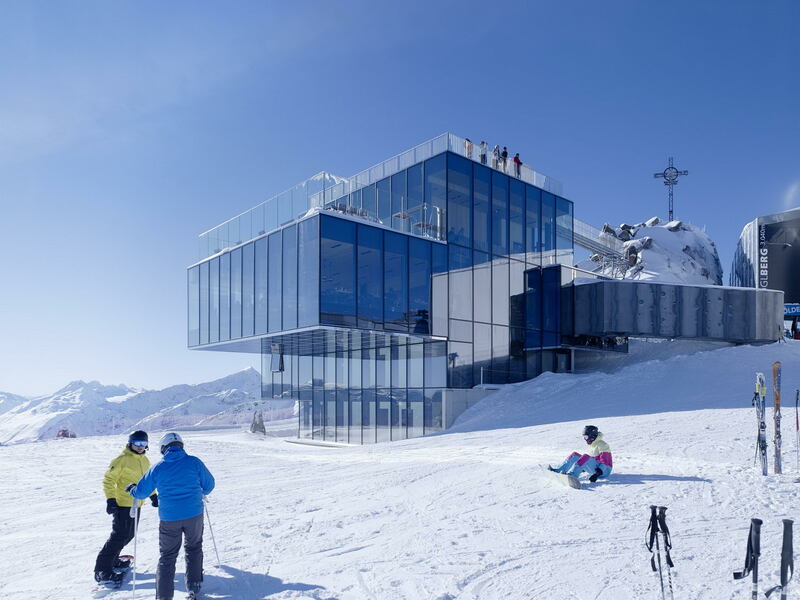 Due to the short construction time-span of 5 months, all construction parts had to be prefabricated on schedule and coordinated with transport vehicles riding to the summit during summer. Adverse weather conditions strongly effected the delivery, a strict planning-schedule has been relevant to the process. 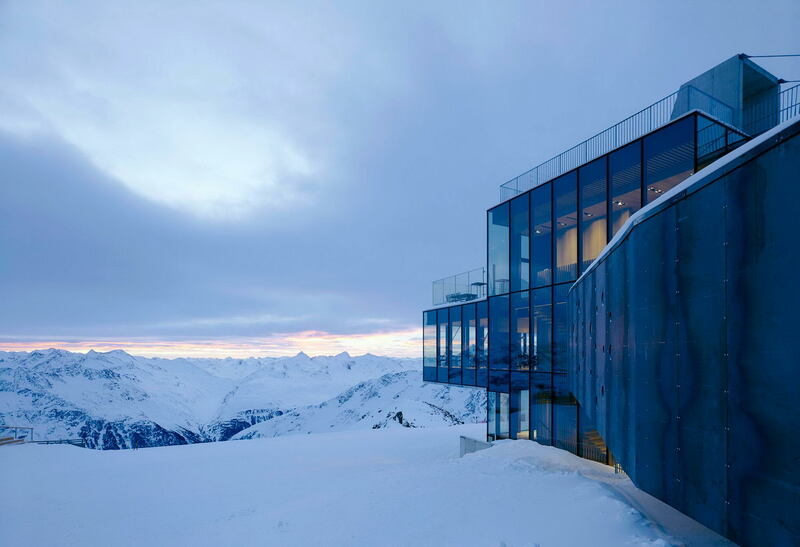 The all-round glass-façade set great demands on the energetic concept. 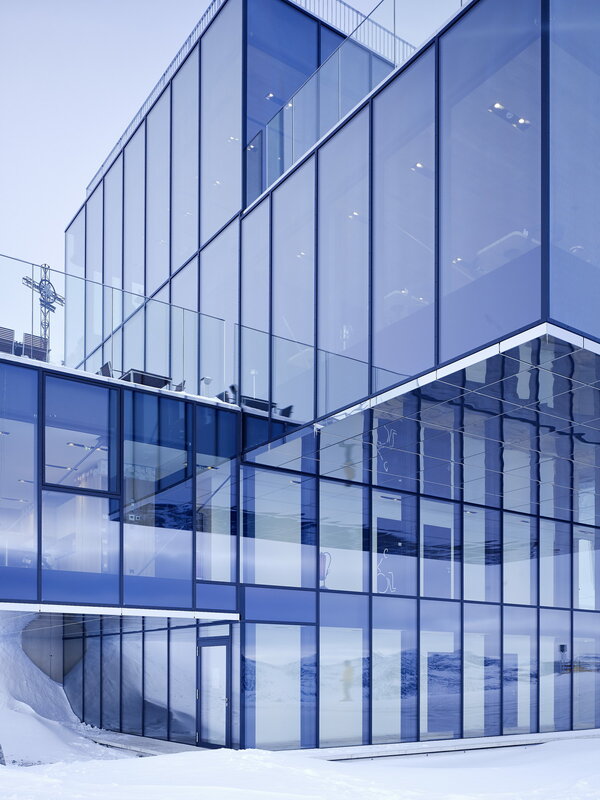 Passive energy winnings resulting from the wide glazed surfaces, temporarily saved into a short-cycle energy-conversion buffer, are able to compensate natural energy losses during night hours or adverse weather. The choice of triple glazing has been made willing to minimize energy losses, normally produced by wide glazed surfaces, and to reduce direct and lateral sun-radiation, to not unnecessarily burden the cooling load on hot summer days. Construction plans have been giving maximum priority to energetic efficiency and passive energy-gain, following the winter garden principle. 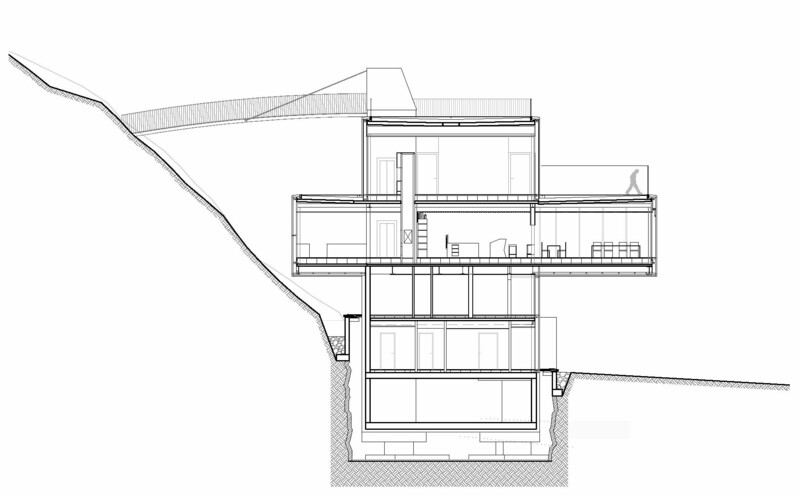 The passive-energy income won by the glass surfaces is buffered by the ventilation system into water reservoirs; the stored energy is transferred into a water-guided underfloor heating system, able to supply for the building’s basic heating demands. In order to quickly react to the rapid weather and temperature variations, the room temperature regulation is controlled by an air conditioning system, equipped with a heat recovery system, which can be used for both cooling and a heating. The warm air is induced through conditioning convectors, placed along the façade, able to create an additional heat curtain at extreme temperatures (-30°) in combination with mobile sun shelters (as a second façade with double heat-regulating function). The waste-heat from the cooling units is then fed into the heating system. The energy of exhausted used air is then withdrawn by an after-cooling register and blown-out at a temperature between -5° and 0°, in order not to endanger the Permafrost, and finally fed to a climate convector via heat pumps.